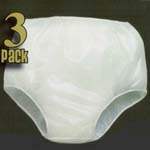 Package of three reusable adult vinyl pants allow you to experience confidence and comfort. 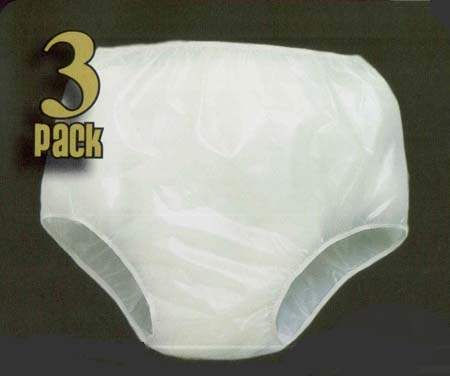 The vinyl(latex free) pants are quiet and soft. Vinyl pant will stay soft wash after wash. Pants have elastic at the waist and leg openings for comfortable protection against leaks. Pant can be worn by either men or women. Vinyl Pull On Pant is machine washable and dryable as well. You will be able to use bleach if needed. Washable, waterproof briefs for daytime or night time incontinence. Soft elastic bindings on legs and waist won't chafe. Will hold up to repeated washings, can even use mild bleach and fabric softeners.